When we DO talk about what they need right now, we mostly focus the lowest section of Maslow’s Hierarchy: does Jimmy have food and a place to sleep? If we get to the second level, safety, we tend to stick to physical safety: does Jimmy have bruises we can’t explain? This is problematic when it comes to gender and sexual orientation, as these identities are essential to who our kids are—and are often targets of ridicule and abuse, both from within and without the school community. We commonly think, especially when working with people younger than high school aged children, that what they’re experiencing in terms of their LGBT+ identity is either not real (the “they’re too young” argument) or not permanent (the “it’s just a phase!” argument). Plus, considering our students as capable of having feelings about these things is uncomfortable for many teachers! In this piece, you will see a number of initialisms. I want to be clear that the differences between terms used are intentional. They indicate the populations studied in anything cited. LGBT+: Includes lesbian, gay, bisexual, transgender, intersex, queer, asexual, and any other person who is not straight and cisgender. These are phrases are problematic. I hear you if you didn’t realize that something you said, like a phrase above, is homophobic or hetero-normative. Things have changed so much just in my own three plus decades of life, and they have changed even more if you are in your 40’s, 50’s, 60’s, etc. There are words and ideas that used to be “okay” and aren’t now. I hear you. I get it. But, it doesn’t make it okay to keep using those words and ideas. This isn’t the first time terminology has changed, and we have had to adapt. I teach middle school and I have a number of LGBT+ students in my classes. When I talk about their needs or stories, even with other educators, I almost always get shut down immediately. Regarding their age: my students are 10-15 years old. This is the age where most of us experienced our first real crush and, some of us, our first heartbreak. Think back to when you were that age, the person you had a crush on, the feeling that you would just die if they found out or if they rejected you. The feelings were very real, weren’t they? And for many of you, were they in line with the identity you have today? Regarding gender identity, this is a time when a lot of kids experiment…with fashion, music choices, books, attitudes, and even curse words. Most kids aren’t going to throw gender identity in without it coming up naturally; there is enough to deal with already. Even if it does turn out to be a part of “growing up” for a student, why deny how they are feeling at that moment? Who does it help? Regarding it being a phase or a fad, though there aren’t statistics on it, people who come out don’t tend to “go back in.” The decision to come out is not taken lightly, as the ridicule they may experience will never disappear. For example, if at 14 you come out and this personal information gets online, and it’s still there when you’re looking for a job at 34. For many adults when a kid “comes out” they believe it’s for attention- or better yet, fun. Even if you think a kid may have come out for “fun,” who cares? We are teaching the kid in front of us, right now, and that kid might identify themselves as LGBT+. You have LGBT+ students in your school, take a full stop and know the statistics. According to a January 2017 Gallup Poll, 4.1% of Americans identify as LGBT. [iii] Note, that’s just LGBT, not any of the other letters (asexual, intersex, etc.)! In total, that’s just over 10 million Americans, slightly more females than males. So, if you have a school with 500 students, you are statistically guaranteed 20 LGBT pupils (again, just LGBT, not queer, intersex, asexual, etc.). 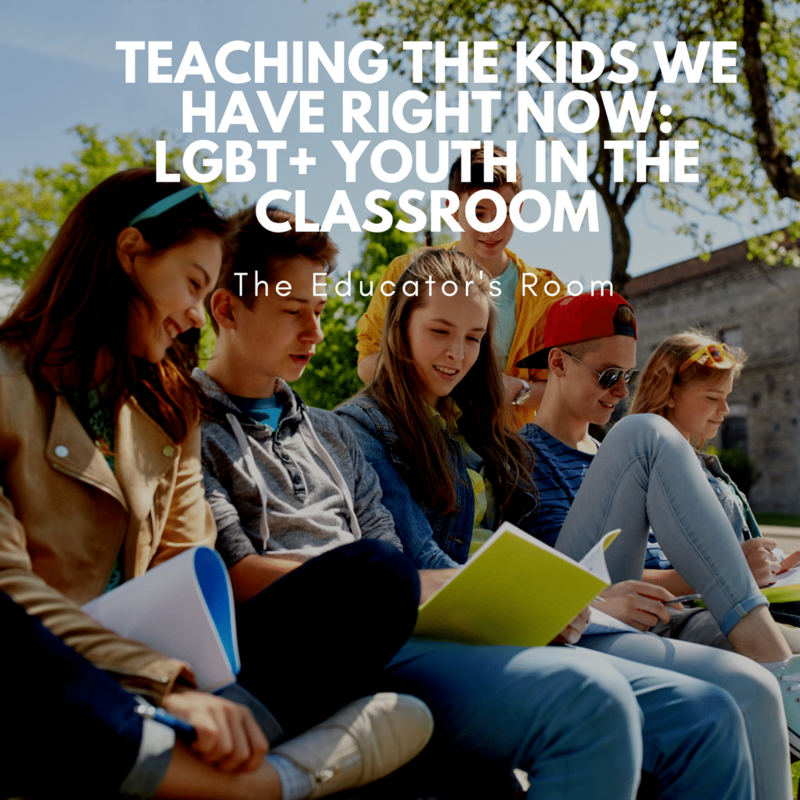 In a classroom with 25 kids, you are statistically guaranteed that one of your kids is a member of the LGBT community. In 2018, how many of your classes are smaller than that? I know statistics and reality are not always in line. So, maybe your class of 25 doesn’t have a single member of the LGBT community in it. But, unless that class is the entirety of your school…you have community members around you. Knowing this, how can we justify not going out of our ways to make our classrooms safe for them? How can we be okay with making an offhand homophobic or gender-normative comment? Yet, we do. Every day. With or without meaning to. Knowing that kids are reporting homophobic and heteronormative comments from teachers at an alarming rate, and attempting suicide at an even more alarming one, I hope you are ready to start (or improve upon) your work with having a safe classroom for LGBT+ students. The good news is, there are many things we can do to support our LGBT+ students, even ways that don’t take up a lot of time, energy, or call anyone out! Post a “Safe Space” sign on your door or somewhere in your room. You can get a Safe Space kit from GLSEN, but there are also posters available (for free) on sites like Teachers Pay Teachers. Engage in inclusive language. My kids actually called me out on this one, when I was saying “ladies and gentlemen!” to get their attention, saying “what if someone here is not a lady or a gentleman?” We agreed on “ladies, gentlemen, and unicorns” for our classroom, as ANYONE can be a unicorn. You find what is right for your room. Make sure LGBT+ history and figures are not ignored by your curriculum. [viii]Even a simple mention of so-and-so’s partner shows kids that people like them CAN do great things. Don’t assume a child’s sexuality or identity. This is their thing, not yours. If a kid decides to confide in you, LISTEN. Even if you don’t like it, they trust you enough to tell you. Your number one job is to be their ally at that moment; you don’t have to report the fact that they confided in you unless something a mandated reporter should report comes up. I know an article like this won’t change a person’s beliefs; you are free to believe whatever you want. This is not about the beliefs people hold, but the actions that should be taken. Teachers need to show that they care about the LGBT+ kids in their classrooms. We are teaching the students in front of us, not the people they were before or the people they may become. If we focus too much on the past and future of our kids, we miss the amazing people they are right now—and we miss opportunities to help them through the rocky roads they’re walking. In short: meet our LGBT+ students where they are, believe them when they are brave enough to admit their feelings, choose kindness, and love them no matter what.